In the world of advertising, the Tropicana disaster of 2008-09 is already legendary as a failed product debut. The orange juice container redesign by controversial brand guru Peter Arnell eliminated the familiar straw-in-an-orange image in favor of a photo of a glass of OJ. This killed the brand recognition developed over many years, resulting in a 20% drop in sales and the loss of millions of dollars within two months. Tropicana beat a hasty retreat to the old design. 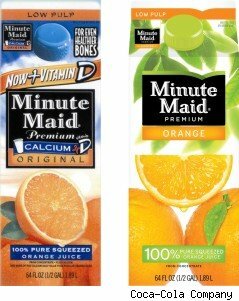 Now, according to Advertising Age, Coca-Cola is taking a similar risky step, re-branding its Minute Maid line of juices. The company wants to eventually harmonize the images surrounding the brand and the others it owns, including Del Valle, Andina and Cappy. The new orange juice design features whole oranges, slices, and leaves to suggest the groves from which it comes. As you'll see from the pictures above, the new packaging has more green, and the blue is gone. I like it. The update doesn't wander far afield from Minute Maid's previous look, and has never had the whimsical appeal of the Tropicana brand, so I wouldn't expect this change to spark the same kind of fight or flight reaction among the juice-drinking population. Any change in the sector, however, regardless of how slight (Arnell is also the person responsible for the rotation of the Pepsi logo, which he attempted to explain in a pitch that has become notorious for its doublespeak), is always a risk. Watch Peter Arnell explain his failed Tropicana design.